One of the best pitching machine softballs made, these 12-inch JUGS Sting-Free Realistic Seam Softballs are more like a real softball than ordinary dimpled pitching machine softballs. The simulated seams allow batters to pick up the spin of the ball better than with dimpled balls, which makes for even better hitting practice with curve balls. The same size and weight as a regulation softball, they feel more like a real baseball when they are hit, too. 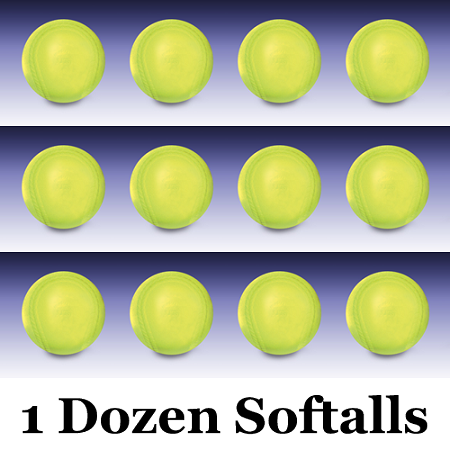 Not only will these balls help batters become better, they are great for fielders, too. Pitchers, infielders and outfielders will get a much more realistic experience when throwing the balls and picking up the spin of the ball off the bat. Available in optic yellow only, these JUGS Sting-Free Realistic Seam Softballs won't sting a batter's hands - even in cold weather. They feature a one year manufacturer's warranty and, although they are manufactured specifically for JUGS pitching machines, they work fine with most other pitching machines. Purchase them with any Pitching Machine, and they ship for free! JUGS Realistic Seam pitching machine softballs feature a 1 year manufacturer's warranty against damage caused through normal use. JUGS Sports will replace your softballs, free of charge F.O.B. to its factory in Tualatin, Oregon; provided, however, that upon request, the Buyer shall return the allegedly defective balls to the Company s factory with transportation charges thereon prepaid. This warranty shall not be effective if the balls have been subject to misuse, negligence or accident, nor if the balls have been repaired or altered outside of our Tualatin factory in any respect which, in our judgment, affects their condition or operation. For additional information please see the JUGS Sports Terms and Return Policy section of our Shipping, Returns and Warranty page. No matter where you order JUGS Realistic Seam Sting-Free Softballs from, NOBODY actually stocks them; they all ship directly from the manufacturer's warehouse located in Tualatin, Oregon. Therefore, the shipping time frame is exactly the same no matter what website you order from (we hope that it is this one!). JUGS softballs typically take 2-4 business days to ship from the time you place your order. They ship via Federal Express (FedEx) Ground and could take anywhere from a day or two to a week to get to you AFTER being shipped, depending on your proximity to their warehouse. We will notify you of your tracking number the moment we receive it from the manufacturer's warehouse. Expedited delivery may be available and you can certainly contact us to see what the cost would be for special one day or two day delivery. Be forewarned; it is extremely expensive and generally costs several times more than the cost of the balls, themselves, and still does not affect the processing time. In other words, it will still take the same time for the warehouse to process the order; it will just get to you faster once it is shipped!